Show off your products with this space efficient and attractive slatwall display! Thick edge banding on slatwall grooved edges ensures your slatwall units will continue to look great for years. See the slatwall accessories section and the shelving section of our website for a wide selection of display options, allowing you to customize this fixture to your store`s needs. 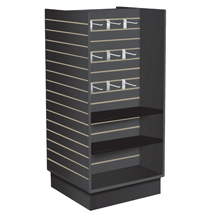 Shown with 10"D x 24"W shelving and accessories, all sold separately. Slatwall display ships knocked down to save you money; some assembly is required. Optional caster kit available for added mobility, search item 3506.